Was für ein Ding, 3 Lieder von Black Bug auf dieser „Made in Karlsruhe“ Single. „Television Screen“ = LoFi Gitarrensound, verzerrte Stimme, macht eine verstörte, bedrückte Stimmung: gefällt mir richtig gut. „wir zerlegt“ klingt für mich so wavig LoFi, so Invicible Limits – Devil Dance mäßig, auch das kann was! „Nightstick“ auf der B-Seite macht auch auf bedrohlich / elektro Stimmung, kommt aber nicht an TV Screen ran. 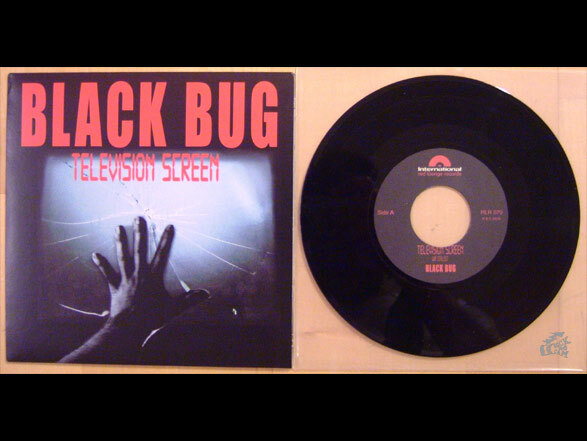 Here is a 7″ single „made in Karlsruhe“ with three songs from the band Black Bug. It starts with „Television Screen“ which is a LoFi guitar song. Distorted voice and it creates a deranged, threatening mood, I really like it. After that there is „wir zerlegt„, gothic- wave feeling and another LoFi sound. First impression is that it reminds me of „Devil Dance“ from Invisible Limits and this is still a good one. On the B-side is „Nightstick„, as well an electro threatening piece of music, but TV Screen is better.